Mag+ is a custom digital design solution, which means we offer InDesign templates for a number of different devices, allowing you to create pixel-perfect designs for any number of screens. However, in many cases, a MIB (Mag+ issue Bundle) created at one size can be read by another device with a different size screen. This article will walk you through those compatibilities. Note: It's important to note the difference between the Mag+ iOS/Android/Kindle Fire app and Mag+ Issues. The app is the container that sits on a device. Mag+ Issues are content displayed by the Mag+ app. 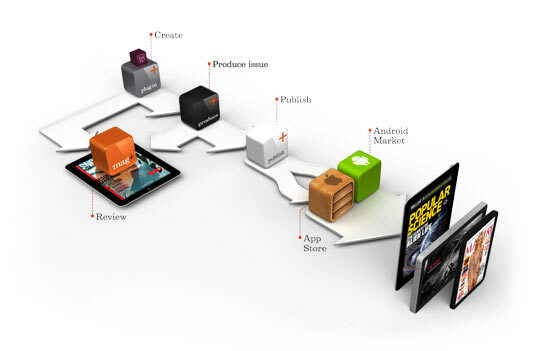 Mag+ Issues can be embedded within an app (known as Single-Issue apps) or can be requested from the Mag+ Publish portal. Both the iOS and Android (which includes Amazon Fire) apps are resolution independent. For iOS, that means that a single iPad app will render correctly on all versions of the iPad, including the iPad Mini. An iPhone app is separate as it presents a user interface that is optimized for the small screen, but a single app will run on an iPhone 4 and higher. You may create two totally separate apps or one universal app, which will present the correct UI on the correct device. For Android, the app will scale as needed to run on all devices that are at least running Android OS 4.0. Once again, the tablet version presents a different UI than the smartphone version, so you must build two separate apps or a single universal app for it to work on both. If you choose to build a universal app, you may direct different Mag+ Issues to the tablet and the smartphone, but you may only offer one Subscription across all devices. Note: If you have not uploaded an Android smartphone MIB but have an iPhone MIB available, Mag+ will serve the iPhone MIB. Mag+ will first attempt to serve an iPhone 5 MIB. If one does not exist, it will look for an iPhone 4 MIB. Every Issue created in Mag+ is built on an InDesign template that is sized to a particular resolution—a pixel height and width. Android tablets: MIBs will scale to larger and smaller screens. So you can create one 1280×800 MIB to serve to all devices. If the device screen is a different aspect ratio than the MIB, the MIB will letterbox to fill the unused space on the screen. A 1280×720 MIB will cover all smartphones. Apple iPads: MIBs will upscale on iPad Retina devices, so they will fill the screen, however they will not look as sharp as Retina MIBs because there are fewer pixels to fill the space. iPad Retina MIBs will not downscale for non iPad Retina devices. Apple iPhones: 4/4S MIBs will render on the iPhone 5 and higher, but will appear centered with black bars at the top and bottom, as with all iPhone 4 content on the iPhone 5 and higher. iPhone 5 or higher MIBs will not be delivered to an iPhone 4. When a device requests a MIB, Publish will look for one that matches the screen size. If there isn’t one that is an exact match, it will look for another MIB it can serve, according to the table below. Publish will always try to send a smaller MIB to a larger device and not vice versa (with the exception that it will send a 1280×800 MIB to a 1024×600 device). As more devices are released onto the market, we will add additional templates to support them. Currently you cannot create your own template or alter the existing templates to support different sizes. If there is a template size you need that’s not currently available, let us know in the support forums. Finally, to learn about Mag+’s ability to export content for multiple devices at once, read the article “How to Use Multi-Device Export for Multiple Devices”. This feature lets you, quickly and easily, create as many specifically-sized MIBs as you like to support a wide range of devices. I am glad to find so many helpful information right here in the post, we need work out more techniques on this regard, thank you for sharing.